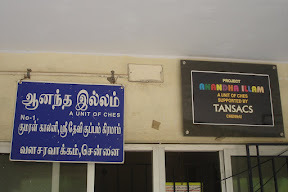 I have visited to CHES(Home for HIV affected kids), Chennai on 05-Apr-2008 to see the organization activity and gather education need. I had discussion with Mr.Shakir (HIV Councilor) to understand home activity. #1 Home Address : Anantha Illam, CHES(Community Health Education Society), 1,Kumaran Colony(Near K.R.Vijaya Garden), Sridevi Kuppam Main Road, Valasaravakkam, Chennai-600 087, TN. #2 At 1994, this home was started by Dr.P.Manorama M.D.,DCH.,DM(Gastro) based on two HIV affected kids & now this home having 45 HIV+ kids(upto age of 15). This home providing completed shelter/education/medical for kids, not for old people. #3 This home receiving orphan kids(HIV affected) from hospitals and government agencies from across Tamil Nadu. After completion of HIV test, based on the results they are deciding the stay. HIV+ve kids will be staying in this home & -Ve kids will be given to Government Child Welfare Society/GULID. 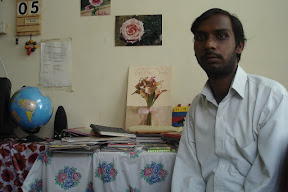 #4 Mr.Muthu Pandian and his wife Chitra working as home manager for this home. Other then this they have 2 full time nurse, 1 – doctor ( daily 4 to 6 pm), 1 – councilor, 5 – people for maintenance, 2 – cook. #5 They are running there own school within the Orphanage for upto 4th standard kids, after that they are sending the students to Cauvery School, Saligramam and Kodambakkam Gov School (10 students) for education. #6 Most of the time this students are alone in this home and watching TV. I spend some time with these kids and they are very much happy to interact with new people. Good part is, non of this kids won’t know they are affected by HIV+ve. Even councilor and admin people not passing this information to external people and schools. Its absolutely confidential information, so I am not took any photos within this home. Bad part is people not ready to spend there time or touch this kids because of HIV. 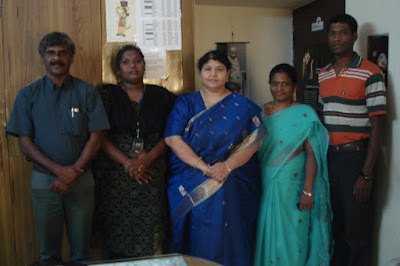 #7 At 3.00 PM, myself and R.Niranjana(Volunteer – Udhavum Ullangal Orkut Community) visited to CHES office and discussed with Dr.P.Manorama M.D.,DCH.,DM(Gastro), Chitra & Muthu Pandi. Other then this Dr.P.Manorama working as child welfare society member. She is very much interested to create awareness and support HIV affected students. #10 What India Sduar can do now ? 10.1 we can deploy permanent teacher for this home school, because already they have only one teacher for entire schools/home. 10.2 We can provide education material like note books, uniform, bag, shoes, etc for home students and out side AIDS affected students. 10.3 We can conduct very small cultural program for this home for external people interaction. Kids will be very happy. Even Our members can take small session from councilor before executing this cultural program in this home. A Visit to Anantha Illam. I and our member Jeyaseeralan had visited the “Anantha Illam” (Community Health Educational Society) on 12th November 2007. There are totally 47 childrens who are infected and affected by HIV, most of the childrens are below 5 years. The Home is also providing education for the children till 5th Standard in their campus itself. Children’s who are studying from 6th Standard are studying near by Corporation School. In our initial discussion had with Mrs.Chitra who is taking care of the home children, we found that the children are in need of our affection and care. The above mentioned basic requirements are going to purchase and provided to the home by an Online Orkut Community named “Uthavum Ullangal” along with my friends on 16th November 2007 at 11am at the “Anantha Illam”. About Uthavum Ullangal: Motto of this Orkut Community is to help and show affection for aged and helpless people. They are visiting an home week end in every month and support their needs. For the past three months they are doing this noble service. The team is leaded by Mrs.Annapoorani her contact number is 9940613036. DATE: 18.11.2007 – SUNDAY – 11 O’CLOCK.